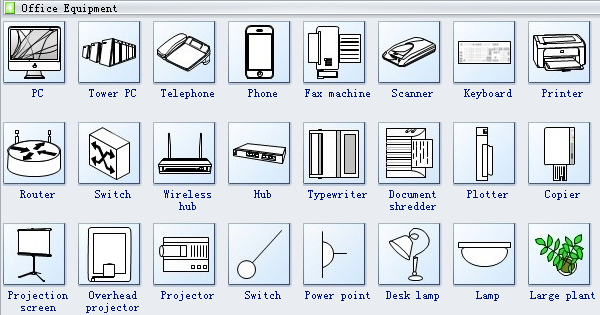 Edraw software provides you many special office equipment shapes, PC, tower PC, telephone, phone, Fax machine, scanner, keyboard, printer, router, switch, wireless hub, typewriter, document shredder, plotter, copier, projection screen, overhead projector, switch, power point, large plant, flower, square waste can, etc. 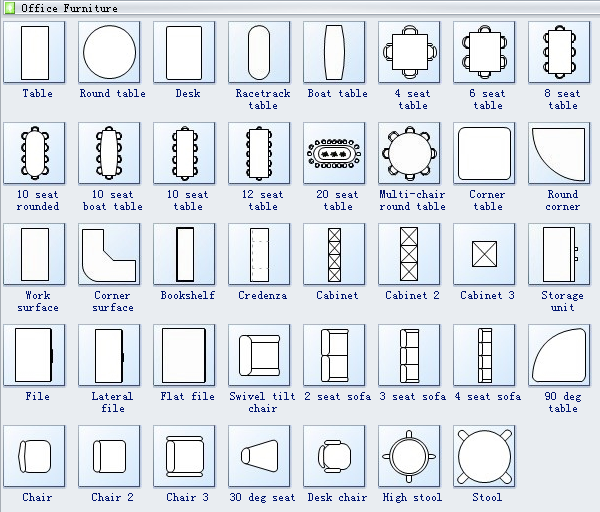 Check out complete office layout guide to get more details. 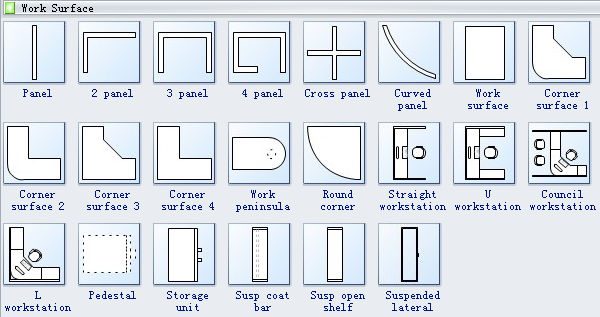 Moreover, check out office floor plan software or floor layout designer here. Tower PC is the enclosure that holds the components of a computer. Fax machine is a machine for transmitting and receiving faxes. Scanner is a device that scans documents and converts them into digital data. Printer is a machine for printing text or pictures, especially one linked to a computer. Router is a power tool with a shaped cutter, used in carpentry for making grooves for joints, decorative mouldings, etc. Document shredder is used to destroy private, confidential, or otherwise sensitive documents. Plotter is a piece of computer printer equipement for printing vector graphics. Projector is a device that is used to project rays of light, especially an apparatus with a system of lenses for projecting slides or film on to a screen. Paper tray is a kind of paper cassette. Waste can is a container for temporarily storing waste, and is usually made out of metal or plastic. Workstation is an area where work of a particular nature is carried out, such as a specific location on an assembly line. Pedestal is the base or support on which a statue, obelisk, or column is mounted. Cabinet is a cupboard with drawers or shelves for storing or displaying articles. Lateral file is equipment that stores file folders in a side-to-side orientation. Stool is a backless and armless single seat supported on legs or a pedestal. Need fresh looking office layout symbols for your design? These office layout symbols are a cinch to pop in. And their crisp, fine detail will make spectacular, easy-to-understand diagrams and presentations to your customers.